Adam Robert Eustace was born in Gloucester on 19/01/1979. A former pupil of St Peter’s High School, he started his rugby journey playing for the local Widden Old Boys and Coney Hill clubs. Eustace quickly developed into a versatile player, specialising as a second row forward who was able to provide cover in the back row, and it wasn’t long before he was selected to play for Gloucester Colts and England Under 19’s. Having excelled at youth level he progressed into the Gloucester United, South West Divisional and England Under 21 sides, before being signed from the Gloucester academy and given a professional contract in 1998 by then Gloucester head coach Philippe Saint-Andre. Eustace made his first team debut on 21/02/1999 in a 27-9 Cheltenham and Gloucester League Cup victory against Leeds at Kingsholm. That same season he went on to play and score a try in the semi-final victory against Sale, before starting in the back row in the cup final victory against Bedford at Franklin’s Gardens, as Gloucester retained the trophy for a second season. 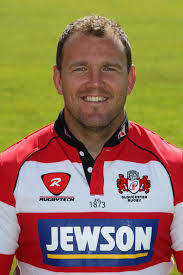 By the end of the 1998-1999 season he was becoming a regular name in the Gloucester first team matchday squad. He continued his rapid development the following season under the guidance of Gloucester forwards coach John Brain and Kiwi legend Ian Jones, earning himself a place in the England Development squad and helping Gloucester to a third place finish in the Premiership, and with it qualification for the Heineken Cup for the first time in the club’s history. When Ian Jones retired at the end of the 2000-2001 campaign Eustace cemented his place in the starting lineup alongside Rob Fidler in the second row, whilst continuing to provide cover in the back row. He narrowly missed out on selection for England’s 2001 summer tour to North America, despite players being unavailable due to being on Lions duty in Australia. More frustration followed a few months later when he broke his leg in January 2002, prior to his expected selection for the England A squad to play Scotland A. This forced him to miss the remainder of the season, including the Parker Pen Shield (European Challenge Cup) semi-final defeat to Sale Sharks at Franklin’s Gardens, and the Zurich Championship final victory over Bristol at Twickenham. The 2002-2003 Zurich Premiership season proved to be extremely eventful for both Eustace and Gloucester. Having received the only red card of his professional career in October 2002 for stamping on Wasps fly-half Alex King in a narrow defeat at Adams Park, he started in the Cherry and White’s 2003 Powergen Cup final victory against Northampton at Twickenham. By the end of the 2002-2003 season he had helped the club finish 15 points clear at the top of the Zurich Premiership table for the first time since the league structure had been introduced in 1987-1988, and thereby automatically qualify for the inaugural Premiership play-off final. However, under the new league system Gloucester were rewarded with a 3 week lay-off, while their opponents Wasps defeated Northampton in the play-off semi-final during this period to qualify for the Twickenham showdown. As a result they lost their momentum and the table-topping Gloucester team that included Eustace could do nothing to prevent an emphatic 39-3 defeat. The 2003-2004 season saw him start the 44-35 Zurich Premiership wild-card semi-final victory over Sale at Kingsholm. The Zurich wild-card competition was contested by the teams placed fourth to seventh in the final Premiership table and despite beating Sale, Gloucester forfeited their place in the final after English teams were awarded an additional Heineken Cup qualification place due to London Wasps winning the 2003-2004 Heineken Cup. This additional place was awarded to Gloucester as the next highest placed team in the league not automatically qualified for Europe. Despite receiving offers to leave his home town club, Eustace put pen to paper and signed a new two year contract with Gloucester in March 2005. At the end of the same season he scored a try in the Zurich Premiership wildcard final defeat to Saracens at Twickenham. As a result of this defeat the Cherry and Whites had to settle for a place in the 2005-2006 European Challenge Cup and Eustace came off the bench in the final as Gloucester won their first piece of European silverware, with a 36-24 extra time victory over London Irish at the Twickenham Stoop. Gloucester’s good form continued into the 2006-2007 Guinness Premiership season as they topped the table by virtue of number of games won, after finishing the season on the same number of points as Leicester Tigers. Having demolished Saracens 50-9 in the play-off semi final, Eustace came off the bench in the Twickenham final as Gloucester were emphatically beaten 44-16 by Leicester, who claimed the Premiership title. Prior to the demoralising defeat to Leicester Tigers in the 2007 Premiership final, Eustace had signed to play for Llanelli Scarlets the following season. Having made 191 first team appearances in all competitions for Gloucester since his debut in 1999, he moved to South Wales for what was the Scarlets’ last season at their historic home of Stradey Park. He helped Llanelli finish 6th in the Celtic League before being released after just one season in Wales. In June 2008 Eustace jumped at the chance to return to Gloucester, signing a one-year contract at the club where he made his name after rising through the academy system. Unfortunately, he missed the start of the 2008- 2009 Guinness Premiership season after breaking a bone in his foot during pre-season. Upon his return to the Gloucester line up he was soon back to his imperious best in the cherry and white shirt, thus earning himself a new one year contract at Kingsholm in April 2009. By now Eustace had become a seasoned campaigner and Gloucester were keen to utilise his vast experience. At the end of the 2008-2009 season he captained a young Gloucester United side in the Guinness A League semi final defeat to London Wasps. Having missed the 2009 EDF Energy Anglo-Welsh Cup final defeat to Cardiff Blues at Twickenham, Eustace started in the back-row in the following season’s re-branded LV= Cup final defeat to Northampton at Sixways, Worcester. After 11 seasons at Kingsholm and having made 242 appearances for Gloucester, scoring 55 points in the process including six tries in the Premiership, Adam Eustace played his last game for the club on 24/04/2010 in a home victory against London Irish. That same month he signed for Northampton where he spent a frustrating season and a half, making just four appearances for the Saints in a spell that was blighted by injury. He was finally forced to retire from the game aged 32 in December 2011 due to a neck injury, after 13 seasons at the top level of British professional rugby and having played for three of the biggest clubs in Europe. In August 2012 Eustace returned to his first club, Widden Old Boys, in a coaching capacity, as he looked to give something back to the game.